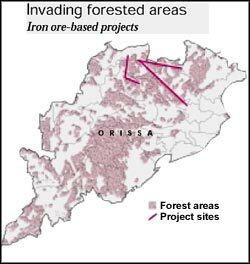 mineral-rich Orissa is being eyed by the corporate sector seeking to cash in on its iron ore reserves. Work on projects worth Rs 30,000 crore has already begun in the last two years and the Orissa government is considering investment proposals of another Rs 1,22,000 crore. The state's industry department says 11 memoranda of understanding have been signed while 13 major proposals are in the pipeline. But environmentalists suspect that in their rush to gain from the rising global demand for steel, the companies might just mine and export the iron ore and not fulfil other obligations they agree to now, like setting up of steel plants. They cite past experiences to corroborate this fear and also point at instances of environmental and local concerns being neglected amid negotiations involving big money. In September 2004, South Korean steel major Posco in alliance with Australian mining giant bhp Billiton made the biggest investment proposal in the state so far: projects worth Rs 39,000 crore. Soon after, India's steel major tata Steel offered Rs 15,000 crore for another iron ore and steel project. Even companies with no known expertise in steel making want a slice of the state's 4,833 million tonnes of proven iron ore deposits, which account for 28 per cent of the country's reserves. Among these are Ashok Magnetics and Vedanta Resources plc, a London-listed company of the Sterlite group. The state government policy requires any company intending to mine iron ore to complete land acquisition for setting up a steel plant, achieve financial closure for the project and invest 25 per cent of the project cost to become eligible for setting up a captive plant. A company can be allotted the leases only after it spends 50 per cent of the project cost. These compulsions have led to a sudden spurt of proposals for steel factories. bhp Billiton has proposed to produce 30 million tonnes iron ore per annum and export another eight million tonnes. It also plans to establish a million-tonne coke plant. tata Steel wants to mine 500 million tonnes iron ore over a period of 50 years, besides setting up a six million tonne steel plant at Duburi in Jajpur district and developing the Dhamra port in Bhadrak district. But Manas Jena, state convenor of Orissa Mine Area People Action Network (omapan), a voluntary organisation, warns: "Once the iron ore reserves are leased out, the companies will not bother to manufacture steel. The iron ore would automatically find its way to the global market as it would fetch the companies a quick buck". Many companies had acquired land in the state to set up steel plants in the 1990s too, but these plants never materialised. Jena suspects the companies would now pressure the government to amend the law so that they are spared the trouble of making steel. Currently, 73 companies are either registered or are in the process of registering to export sponge iron, an intermediary product in steel manufacture. Environmental risks Proposals for opening mining-based industries have been made for 15 districts --13 of them in Scheduled Areas. Tribals comprise around 68 per cent of the population in these areas. A large chunk of their habitation has already been taken up by national parks and protected areas and the Orissa government has a poor record in rehabilitating the displaced. Balaji Pandey of Bhubaneshwar-based Institute of Socio-Economic Development says the state's rehabilitation and resettlement policy needs crucial amendments. Instead of giving cash compensation to the tribals, they should be made shareholders in profits from the projects, he suggests. The ecological harm by unplanned mining activity is evident in the mineral-rich Keonjhar district, where the elephant habitat has been severely harmed. Marauding elephants often raid human habitation in Keonjhar and have killed about 100 villagers in the last five years. "Rampant flouting of environment norms has fragmented crucial elephant corridors. Allowing mining operations without a well laid out environment policy would be fatal for the state's wildlife," warns wildlife activist Biswajit Mohanty. Voices raised against mineral-based companies taking up projects in Scheduled Areas have allegedly been crushed. "Public hearings were conducted in the presence of senior government officials and resolutions were adopted at gun point at Lanjigarh in Kalahandi district and Kashipur in Rayagada district," alleges Prafulla Samantara, an activist.